Thousands of people cheered as the red and the blue osses went through the streets. 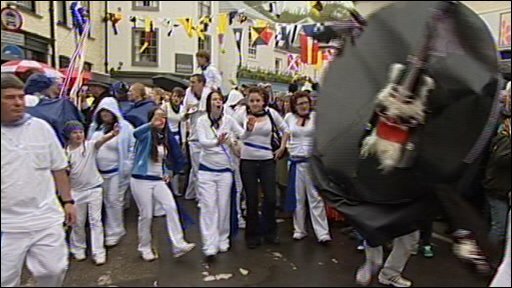 The Cornish town of Padstow has been holding its traditional Obby Oss celebrations to mark May Day. Exiled Padstonians travel across the world to return home for annual event, which is said to be one of the oldest May Day traditions in England. Thousands of people cheered and clapped as the red and the blue obby osses - hobby horses - were accompanied through the streets by dancers and singers. Being caught under the cloak of an oss is considered to be good luck. The exact origins of the Obby Oss are not known, but it is believed to date back to pagan times and the Celtic festival of Beltane. It was a spring festival dedicated to the return of the Celtic sun god Bel, thought to cause the crops to grow and the hours of daylight to lengthen.